Home » Kansas City FAQs » Who was Jesse James and what was his connection to the Kansas City area? Who was Jesse James and what was his connection to the Kansas City area? 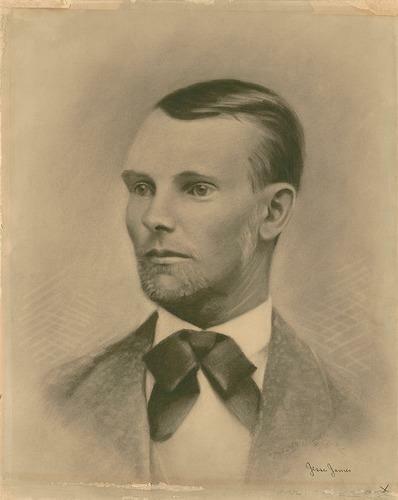 Jesse James was born near Kearney, Missouri in 1847, the son of Zerelda Cole James and the Reverend Robert James, a well-respected Baptist minister who ran a prosperous farm, owned slaves, and was involved in the creation of William Jewell College in Liberty. During the Civil War, Jesse’s older brother, Frank, fought with Confederate forces under General Sterling Price, and when he returned from this service, both he and Jesse took part in the guerrilla warfare then raging in Missouri and Kansas. After the Civil War, the James brothers and their band, many of whom also were former guerrillas, engaged in a series of raids on banks, stagecoaches, and trains throughout Missouri, but also in other states in our region, including Iowa, Nebraska, Arkansas, and Texas. Some newspapers described Jesse James as a notorious outlaw. Others, such as the Confederate-leaning Kansas City Times, championed his cause and proclaimed his innocence. A popular perception of James as a Robin Hood-like folk hero was also fueled by animosity toward Reconstruction policies and public distrust of banks and railroads, institutions often targeted by James. During the heyday of James’s career as an outlaw, he and his gang staged a notorious raid on the Kansas City Fairgrounds located just south of 12th Street between Campbell and Tracy. James also resided in Kansas City for a time with his wife, under an alias, in a home near 10th and Troost. Jesse James was killed in St. Joseph, Missouri, on April 3, 1882, by a young member of his own band seeking reward money. The story of Jesse James continues to fascinate people today, spawning numerous articles, books, and movies, as well as drawing tourists to the many historic sites in the Kansas City area associated with his adventures.